Power line disturbances occur on an average of four times a day, according to studies by the Institute of Electrical and Electronic Engineers (IEEE). These disturbances—increases in current that can damage electronic devices plugged into outlets—may be caused by lightning or other weather-related incidents; traffic accidents affecting power lines; the use of electrical products such as motors, compressors, and fluorescent lights; high-powered electrical equipment and voltage fluctuations initiated by a power company; and high-frequency noise. Such disturbances can interrupt or wipe out power service and damage electrical equipment. Both surges and spikes can be prevented by using a surge suppressor, an apparatus that serves to ground the interference or, in other words, run the interference into the ground rather than into the electrical equipment, and/or absorb the excess flow of current throughout an electrical system. Spikes and surges can damage electronic equipment even when it is not turned on. One of the first surge suppressors was developed by the General Electric company in the 1950s. A similar device was being developed in Japan around the same time. Initial surge suppressors utilized selenium rectifiers (components used to convert direct current to alternating current) and, later, carbon piles (disk-shaped components used to carry current). Most surge suppressors commonly used today utilize spark-gap technology—a system whereby the suppressor breaks down, or shorts out, currents as the voltage applied to an electronic device exceeds the maximum tolerance, or rating, of the device. There are three types of spark-gap surge suppressors, gas tube suppressors, metal oxide varistor (MOV) suppressors, and silicon avalanche suppressors (a specific type of transient voltage suppressor [TVS]). The type names refer to the materials that are the main component of each type of surge suppressor. A TVS utilizes a process called "reverse bias voltage clamping." In this process, the excess current flowing through a TVS diode (a tubular semiconductor device that is similar to a resistor) breaks down and becomes a short circuit when the voltage applied to a circuit exceeds that circuit's rated avalanche, or maximum, level. A TVS is only used with direct current (DC) circuits, where the current only flows one way (such as in an automobile battery), but two TVSs placed back to back will protect an alternating current (AC) system, where current flows both ways. A gas tube suppressor is commonly used with communications and voltage power supply lines. The gas tube suppressor shorts out a power surge and carries any associated high current to the ground, bypassing the circuit which would otherwise be affected, by providing a low-voltage path for the excess current through a ceramic or metal tube. Gas in the tube ionizes during a surge and creates a conducting state within the suppressor. The surge is transformed in this conducting atmosphere into a discharge arc, which shorts out the suppressor, and any high current is grounded. The gas subsequently deionizes and the suppressor is reset. 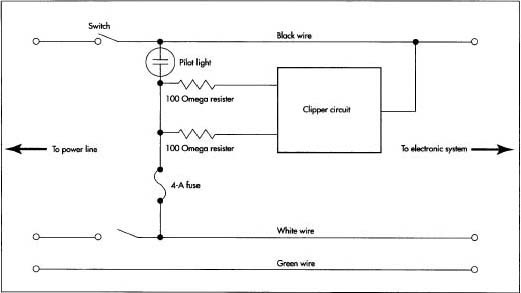 Circuit diagram of a surge suppressor. A MOV uses variable resistors, or varistors, and is thus most functional with an AC system. An MOV suppressor absorbs extra voltage during both positive and negative swings in an AC system through a process known as clamping. When the voltage applied to the circuit exceeds the MOV rating—the load above which the MOV is supposed to be triggered—a short circuit is caused and the voltage is transferred into the absorbent body of the MOV suppressor, thereby bypassing the circuit that would have otherwise been disrupted. The actual assembly of a surge suppressor is relatively simple. The complexity of the instrument lies in the functions of the various components. The main component of a gas tube suppressor is a cylindrical ceramic or metal tube to contain the oxygen gas, which will carry the excess current. This type of suppressor also utilizes brazing washers made of copper or an alloy of copper and silver, thin-walled hollow electrodes made of a substance such as Kovar with radial flanges and absorbent getter material. The main components of an MOV suppressor are the disc-shaped, ceramic MOVs, which absorb the excess current. This type of suppressor also utilizes ring-shaped components surrounded by coils. These components are called balanced toroidal chokes, a type of inductor which is a component that stores electrical energy as an electromagnetic field. The inductor expands and collapses to maintain a constant flow of current throughout the coil. Flat rectangular or disk-shaped high-frequency capacitors and VHF capacitors may be used for filtering electromagnetic and radio frequency interference. A capacitor stores an electrostatic charge and increases or decreases the charge to maintain a constant flow of voltage across the component. The components are all mounted on a circuit board made of rigid, nonconductive material, such as fiberglass. 1 First, the ends of the ceramic or metal tube must be fitted with conductive metal material such as copper. This is known as metallization. 2 Next, brazing washers are attached to the metallized ends of the tube. 3 Thin-walled, hollow electrodes with radial flanges for connecting with the washers are then inserted into either end of the tube. 4 The assembly is then heated to braze the components, and the interior of the tube is evacuated. 5 The tube may also be lined with getter material to absorb any undesired gases in the interior of the tube. 6 First, the circuit board is metallized (a circuit is traced) with copper foil, copper deposition, or another highly conductive material. 7 Next, slots for the resistors and capacitors are etched into the metallized circuit board. 8 The MOVs, toroidal chokes, and capacitors are soldered to the circuit board. 9 Outlets and an on/off switch are attached, and the unit is screwed into a plastic or metal casing with openings for the outlets and the switch. Electronic devices are subject to strict specification and quality control requirements. The IEEE, which is a standard-setting body accredited by the American National Standards Institute, sets standards that American electrical equipment must meet in order to be sold. Most, if not all, electrical equipment for sale in the United States is also tested by Underwriters Laboratories (UL), an independent company which provides product safety and performance testing. The UL seal on the packaging of electrical equipment indicates that those products withstood this testing. UL also assigns ratings to products based on safety and performance factors. Thus, not only does the seal indicate that a product passed UL's tests, but the rating indicates how well the product performed in these tests. Because surge suppressor design is fairly simple, new innovations center more on enhancing the original product rather than changing its makeup. While MOV surge suppressors remain the most common apparatus for residential and commercial surge protection, many models of MOV surge suppressors are available. Some models incorporate resistance to phone line interference and state-of-the-art methods of eliminating noise interference. Many changes are package-oriented. The outlet configuration is altered to allow for more appliances to be connected to the suppressor and to accomodate plug-in transformers; the casing is made of more durable materials, like aluminum; and diagnostic LED indicators (lights indicating the status of the line and whether there is any interference) are added. As residential and commercial electronics needs continue to grow at a quick pace, and protection of electronic equipment—especially computer and telecommunications equipment—becomes paramount, this small, simple electronic device is fast becoming a necessary component of any electronic setup. Miller, Mark and Rex Miller. Electronics the Easy Way. Barron's Educational Series, Inc., 1995. Slone, G. Randy. Understanding Electricity and Electronics. McGraw-Hill Companies, Inc., 1996. Breeze, Frank. "Applying Surge Suppressors." Consulting-Specifying Engineer, February 1988, pp. 82-85. Discussion fails to answer a question that defines any effective protection. Where are hundreds of thousands of joules harmlessly absorbed? Protectors that work by 'absorbing' are often so tiny as to be considered scams. Better MOV protectors 'absorb' less energy. Example of a surge protector has other problems. That pilot light (ie NE-2) must have an inline resistor so that the bulb is connected to a current source (therefore does not burn out). Clipper circuit does nothing for a traditionally destructive surge (ie longitudinal mode). If its let-through voltage is a typical 330 volts, then a 5000 volt surge incoming on a black wire is also 4670 volts incoming on a white wire. That clipper circuit has simply given a surge more paths into the 'victim' (electronic system). MOVs never do protection. An effective MOV protector is a connecting device to what harmlessly absorbs hundreds of thousands of joules. That connection is compromised if too long (excessive impedance) - ie more than 10 feet. The only item that must always exists in every protection 'layer' is single point earth ground. Some protection 'systems' do not even have protectors. But in every case, the item that does protection must always exist - single point earth ground. Connections to that item must be low impedance (ie less than 10 feet, no sharp wire bends, no splices, etc). Relevant concepts include conductivity, equipotential, joules, current (ie a minimal 'whole house' protector is 50,000 amps), and impedance (not resistance). A protector is only a connecting device. A protector is only as effective as its earth ground.